Perennials | Homestead Gardens, Inc.
Phlox ‘Pink Flame’ blooms from summer through early fall. “Pink Flame” is a garden phlox variety that grows upright in a clump 2-4′ tall and 2-3′ wide on stiff stems. The bright pink flowers feature a darker pink eye center and are densely packed in large, tiered, domed clusters. Butterflies love these flowers! Winner of the Fleuroselect Gold Medal and an All-America Selection, Echinacea ‘Cheyenne Spirit’ is now ready to make its debut! This stunning mix offers well-branched, uniform, compact plants in brilliant purple, pink, red, orange, yellow, cream, and white. This butterfly-attracting flower will also bring in other pollinators! Heuchera stands out with its lush clumps of ruffled leaves, striking patterns and unique colors. Performing best in partial shade, Heuchera will also produce blooms during the Summer months. Great in masses as ground cover or in rock gardens and open woodland gardens. Also effective as an edger along paths and walkways. Coreopsis ‘Nana’ is a dwarf version that grows in a dense, bushy, slow-spreading clump to 6-9″ tall. 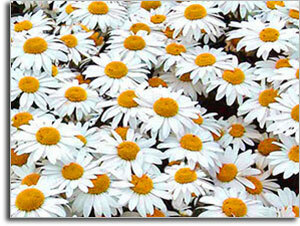 Daisy-like flowers have 8 yellow rays surrounding a yellow center bloom from April to June. If regularly deadheaded, reblooming may occur into fall. ‘Nana’ is excellent for border fronts and edging. One of the hardiest lavenders, Lavender ‘Phenomenal’ has shown tolerance to extreme heat and humidity. This lavender has silvery foliage with a uniform, mounding habit. ‘Phenomenal’ has highly fragrant flowers and foliage, perfect for fresh and dried arrangements and oil uses. Both ornamental and edible, it is a deer-proof variety that can be enjoyed in the sun garden and in the home year-round. Our enthusiastic and extremely knowledgeable perennials team is here to answer your questions and help you choose the best perennials for your situation. There’s always something in bloom for sun, shade, butterflies, birds or deer resistance as well as a variety of bulbs for your space. Click below for availability in each store. As a leader in the local green industry, we must also be a leader in the preservation of our most valuable resources. That is why we have recommitted ourselves to providing a wide selection of Maryland native plants for our customers. Stroll through our time-tested favorites and introduce yourself to the newest varieties. We garden with perennials too; we love them and it shows! Often called ‘Coneflowers’, Echinacea have abundant flower stems that produce brilliant-colored petals displayed horizontally from the cone. 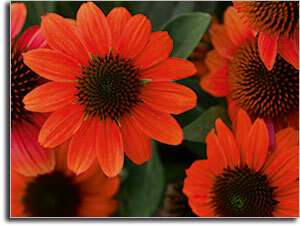 Echinacea will tolerate periods of drought. They bloom from late spring through fall and their bright flowers attract butterflies. We have over 15 varieties of Echinacea in different colors and shapes, including Cleopatra, Double Scoop Raspberry, Harvest Moon and Hot Papaya. The long-lasting blooms of the Gaura lindheimeri ‘Whirling Butterflies’ ride the breeze, their loose sprays of delicate white flowers resembling a swarm of small butterflies. 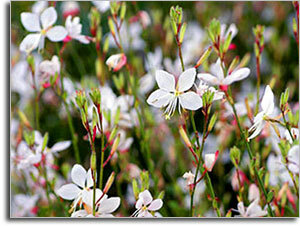 Gaura does best in full sun, but will tolerate some partial shade. They are deer resistant and drought tolerant. Perfect for borders and a nice accent in containers and cut flower arrangements, these perennials do well in most soil types, but must have good drainage. Shasta Daisies come in a number of varieties, with differing petal structures in white and yellow that grow on dark green stems with glossy, dark green leaves. Shasta Daisies bloom from early summer until early fall. Removing faded blooms (“deadheading”) will extend the bloom time of these cheerful perennials. 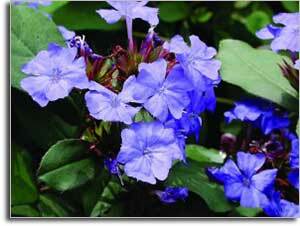 Also known as Leadwort, this creeping ground cover produces clear, deep blue flowers which attract butterflies. Nearly unmatched for its brilliant bronze-red fall color. Excellent ground cover or plant en masse in the border. This plant plans a late arrival in the spring, be patient to see new spring growth. Blooms late summer to mid-fall. Tall spikes of long-lasting flowers and fragrant bushy foliage attract butterflies, hummingbirds and bees. 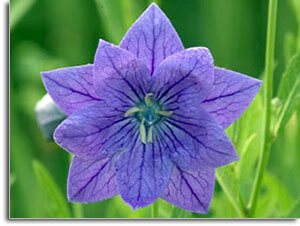 Perfect for the herb or cottage garden, or use in seasonal containers with sweet potato vine, geranium and spikes. Prefers well-drained soil. Blooms mid-summer through fall. We love this perennial for its heat and humidity tolerance and carry as many varieties as we can! ‘Sentimental Blue’ is a dwarf version of balloon flower with puffy, balloon-shaped buds that open into 3″ diameter star shaped, blue blooms in mid-summer. This easy-to-grow perennial does well in average, well-drained soil. It is a great border plant and a wonderful cut flower. 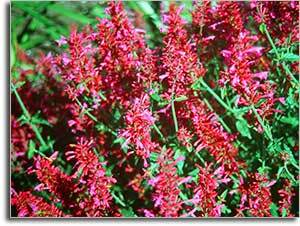 Often called Meadow Sage, Salvia is available in many varieties of varying appearance. 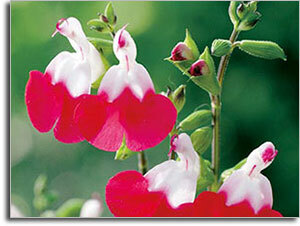 The ‘Hot Lips’ variety (pictured) has two-tone flowers of clear white & cherry red, and bloom heavily from May through September. Stunning deep burgundy fall foliage. We carry 5 varieties of Salvia at Homestead Gardens, including ‘Ultra Violet’, ‘Maraschino’, ‘Wild Thing’ and ‘Watermelon’. Homestead Gardens is committed to building a community of gardeners devoted to preserving and protecting pollinators and their habitat through education, exploration, fun, science and adventure. 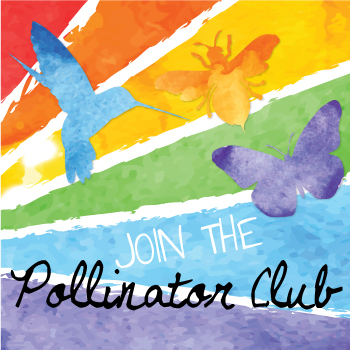 Click here to BEE a hero and join our Pollinator Club!